Along with Stohlquist's Graded sizing, the Coaster PFD Vest features a thin back design offering more coverage and ensuring compatibility with any seat back style. The Coaster is perfect for use with boats that feature a higher seat back, but are right at home in a touring boat with sprayskirt. 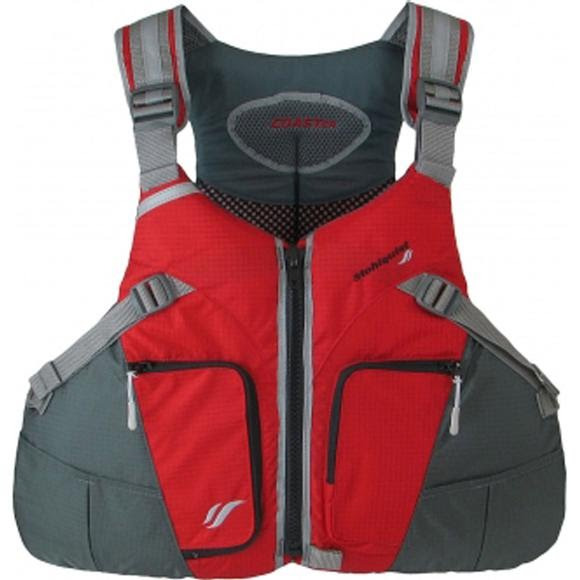 Along with Stohlquist&apos;s Graded sizing, the Coaster PFD Vest features a thin back design offering more coverage and ensuring compatibility with any seat back style. The Coaster is perfect for use with boats that feature a higher seat back, but are right at home in a touring boat with sprayskirt. The Coaster is designed to have a slightly larger footprint, which helps to distribute flotation over a wider area. The result is a thinner profile that provides more mobility and comfort, while reducing interference with today&apos;s taller seat backs. Along with providing a great fit, the Coaster also features multiple pockets that will hold a beverage, your sunglasses, and other small items. Stohlquist&apos;s graded sizing offers the best fit, and lowest footprint possible, for the widest range of body types. They have fine tuned each individual size, and sculpted the foam footprint and foam thicknesses to provide a better fitting, and more comfortable PFD for people of all sizes. this allows them to fit young, smaller framed paddlers up to larger adults in the same style vest, while offering identical mobility and a low-profile fit across the size range.